Albion is a simple, easy-to-fit duffle coat or jacket, suitable for both men and women. It provides a great introduction into the world of outerwear sewing, with both a lined and unlined version available. We’ll walk you through every step in the construction, along with extra customization options that you can try. Start by gathering up all of the supplies that you’ll need. We go over fabrics, notions, and other things you want to have on hand to complete the sewalong with us. A primer on creating a muslin, checking the fit, and the basics of making pattern changes. This is an adjustment that’s useful for both men and women. If you’re a woman (or making Albion for a woman), adjusting the shoulders will give you a more fitted, less boxy look. This is also a great technique for men with broad or slight shoulders. These quick and easy adjustments can make a big difference in the final look of your garment. Adjusting length is a quick fix with big results. Give Albion a little more waist definition by carving out the side seams. Some women might find a unisex coat a little large in the upper arms. Here’s how to fix it without having to redraft the armhole. If you have a large bust, you may wonder how to adjust a pattern with no darts. We’ll walk you through the simple process of adding more room for fullness in the bust / chest area. Ease into your sewing by doing all the prep work at once. Get your fabrics cut, prep your interlining (if you’re using any), apply the interfacing, and staystitch the neck to prevent stretching. If you’re making the coat version of Albion, today we’ll be focused on creating and applying the outer patch pockets. Even if you’re making the jacket, you could still add these as a customization if you like. There are two different techniques we’ll use to construct the yokes, one for the coat and one for the jacket. We’ll cover both of them today in this post. The jacket yoke construction will have a clean finish, even without a lining. The next step in construction is creating the in-seam pockets and sewing the side seams. Both versions have in-seam pockets, with the jacket’s pockets cleverly constructed to form roomy interior pockets as well. Create the hood for your jacket and coat today. This hood is sewn in three pieces for a great fit. For the jacket, we’ll walk through the process of using flat-felled seams to achieve a professional look inside and out. Want to add a drawstring to your hood? Follow this optional customization to create a more adjustable hood. Next up, we’re creating and installing our sleeves. The Albion sleeves are set simply, with no ease. We’ll construct them and set them into our main body today. If you’re making the coat (v. 1), today is the day for constructing the lining. We’ll put together both the main body lining and the sleeve lining. Installing the center facing is a quick and simple step, but there are a couple things to keep in mind. We’ll show you how to finish the front, whether you’re making the jacket or the coat. Want to add a zipper, either in addition to or in place of the toggles? A zipper will help keep you warm and keep the jacket or coat front firmly in place. Grab a separating zipper and try it out. If you want to add more waist definition to your jacket or coat, here’s an easy customization. With a bit of cord and some adjustable ends, you can create an adjustable drawstring waist. If you’re making the lined coat (version 1), today you’ll be installing the lining. We use a simple and easy method of installation, so if linings are new to you, this is a great introduction. We’re wrapping up our sewalong with the final steps: finishing, hemming, and closures. 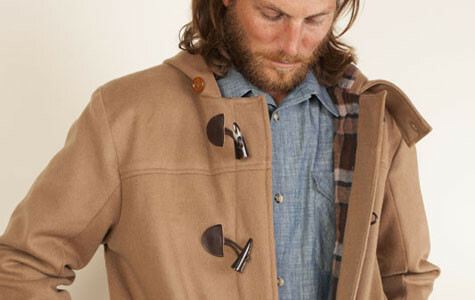 We’ll finish up all the little leftover details and get our toggles installed so you can start wearing your new coat. Can’t find the right toggles for your jacket or coat? Try making your own! With some cording and large toggle buttons, you can create the perfect custom closures for your Albion. If you’re following along with us, you should be just about ready to enter your project into our contest and vote! Here’s how. You’ll need a Flickr account and a valid email address. We had one of the most amazing selections of projects ever in our Albion sewalong and contest. I was blown away by the care and detail that went into every single project. See the winners here.